NERP TONITE! Drew shows us the C.H.I.P. $9 Linux SBC! In 2012 the cheapest Single Board Computer that could run Linux cost around $150.00. The prospect $35 Linux SBC with HDMI was loney talk. If it wasn’t vaporware, it certainly couldn’t be sustainable, we thought. The RPi and its cronies and successors are very much here to stay. 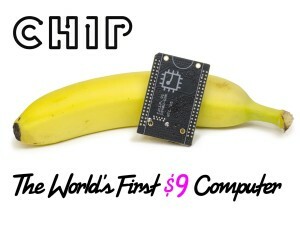 Even so, a $9 credit card sized linux SBC seems a bit “out there”, but here comes the C.H.I.P “The world’s First $9 Computer”. The C.H.I.P. hasn’t shipped in volume yet, but Linux kernel hackers have been able to order alpha versions for testing and for fun. Tonight at NERP, PS1’s Drew Fustini will demo his new C.H.I.P. board. Is it another game changer? We’ll see!